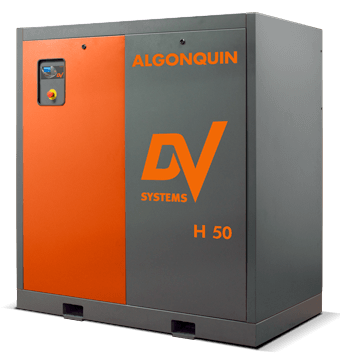 The DV Systems 50HP Rotary Screw Compressor is a heavy duty, high performance and reliable Canadian built air compressor. Available in fixed speed or direct drive VSD this unit will keep running at high duty cycles very extended periods of time. The VSD version will eliminate current spikes on start up and reduce artificial demand by keeping the compressor output closely matched to the consumption. This increase efficiency and saves money.